This beautiful wine rack is a wonderful addition to your kitchen. 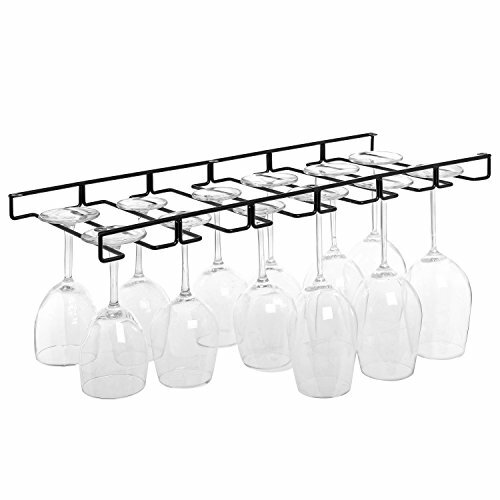 Made of sturdy metal in a sleek and modern design with a classic white finish, this useful kitchen storage rack provides you with a smart, simple, and stylish way to keep up to 12 wine glasses out of the way, safely stored, and beautifully displayed. Simply mount this metal rack under a kitchen cabinet and you'll have an ingenious way to store your stemware conveniently and make clever use of otherwise-unused space in your kitchen. Stemware and mounting hardware are not included. Approximate Dimensions (in inches): 25.5 W X 1.5 H X 10 D.
Sleek white metal wire under-cabinet wine glass rack. Save valuable space and conveniently store up to 12 of your favorite wine glasses. Attach this stemware rack to the underside of your cabinet with proper mounting hardware (not included).